Somerset had it’s first settlement in 1776 and is home to the Somerset Reservoir. Somerset is one of 5 unincorporated towns in Vermont, having unincorporated in 1937, and it is one of the very few communities in America that has a population of 5 people or less. Lyman Enos Knapp, former Governor of the district of Alaska (1889-1893) grew up in Somerset. 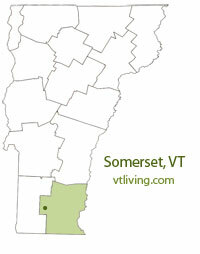 To share any Somerset, VT information, contact us. Learn more about advertising in VTLiving.